The immediate devastation caused by a fire is obvious, but your home might also suffer from widespread water damage, flooding and smoke and soot damage. All of this can leave your house unsafe and unlivable. LRE Construction Services, LLC has the expertise and equipment to restore your home to pre-fire condition. Does your home have heat, smoke or soot damage? Call 1-855-300-3607 for help! We provide 24/7 emergency service in Tampa, Saint Petersburg, Clearwater and throughout Florida. LRE Construction Services, LLC can board up your windows, doors and roof to help protect your property from theft, vandalism and weather damage. We offer comprehensive fire damage repair in Florida, from soot removal to reconstruction. And because we're a local company, we're able to respond to your home faster than other contractors. After the fire is put out, your home will likely be left with widespread smoke and water damage. Repairs should begin quickly. Fire damage repairs must begin as soon as possible to ensure your property can be restored to pre-fire condition. Mold can begin to grow just 24 hours after building materials are wet. Mold damage can cost you more to repair than the damage from the actual fire. The first thing our professionals do when they come to your home is determine the extent of the fire damage, including damage from soot, smoke and water. They will determine what can be saved and explain the process for repairing and restoring your property, so you will know exactly what to expect. If the fire damage is severe, emergency response - such as board up services - will begin right away. 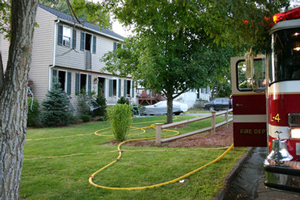 Each fire damage situation is unique, most homes have large losses and several steps must be taken to repair the damage and save the property. Our state-of-the-art techniques and equipment increase the likelihood of saving your property without needing to replace it. We always take care to protect flooring, furniture and personal belongings, and our professionals are trained to treat your property as if it were their own. With 24-hour emergency response service, we also save you time and money. If you've experienced a fire in your home, contact the disaster restoration experts at LRE Construction Services, LLC for help in Riverview, Spring Hill, Largo, Brandon, Plant City, Palm Harbor, Valrico or nearby.